Sakata Kintoki, Sakata Kaidomaru ou Kintaro. (menino dourado). Nascido em meados de 956. Ano Tenryaku 10, na cidade de Nagahama, Sakata província de Shiga-ken Japão. Filho de criação da princesa Yaegiri, filha de Shiman-chouja da aldeia de Jizodo, próximo ao monte Ashigara. Foi amaldiçoada pelo poderoso dragão vermelho. A princesa Yaegiri, por causa de sua horrível aparência, decidiu se isolar na montanha Ashigara, onde encontrou um bebê de aspecto avermelhado. O criou em total contato com a natureza, desde muito pequeno Kintaro, apresentava uma disposição e força incrível, seu passatempo favorito eram lutas de sumo com os animais, pois até então Kintaro não tinha contato com outros seres humanos além de sua mãe. Todos temiam encontrar pelo monte Ashigara, a princesa Yaegiri, que era conhecida por sua aparência como “A Bruxa de Ashigara”. Conta em sua lenda que após derrotar os demônios de Ashigara usando apenas uma machadinha. Caminhava para a fase adulta, levado por aldrões a presença de Minamoto Yamorimitsu, impressionado com a força do garoto o tornou como guarda de sua segurança pessoal. Kintoro acompanhou Minamoto Yorimitsu em suas viagens, Em Kyoto Kintaro estudou artes marciais e liderou por muitos anos o grupo Shitenou. Após o contato com Minamoto-no Yorimitsu Kintaro passou a se chamar Sakata Kintoki, ou Sakata Kaidomaru. Kintaro é uma figura muito importante no teatro Kabuki e Noh. Texto e desenho feito por Felipe Yaemori. In 1970, as a young photographer, Martha Cooper moved from the USA to Tokyo and became fascinated with Irezumi, the art of Japanese tattooing. This great shot from Martha’s Tokyo Tattoo 1970 book represents one of the many gems captured during her stay abroad. Featured are a young couple being tattooed by Japanese tattoo master Bunzo Yamada aka Horibun I in the town of Okachimachi. The work of a traditional Japanese tattoo master in 1970 In 1970, photographer Martha Cooper came to Tokyo and immediately focused on documenting traditional Japanese tattooist Horibun I. Tokyo Tattoo 1970 is a book about the traditional art of tattooing and a portrait of a master artist. Japanese tattoo was a secret art form in the early 1970s. The masters of the traditional techniques were working in small studios, and tattooing was something for a distinguished few. 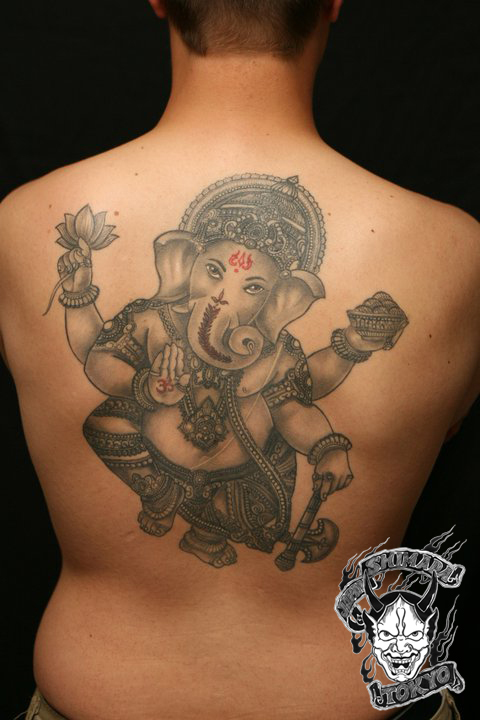 No one could foresee the incredible rise of the art of tattoo internationally in the past 20 years. Horibun I worked with traditional Japanese methods, tattoos made by hand, with different sized needles bound to sticks which he dipped into coloured inks. His motifs were all derived from traditional Japanese legends. Horibun I was a rare tattooist, as he was open to letting a foreigner come to photograph him and his customers. Tokyo Tattoo 1970 tells the story of a Japanese tattoo master and his work. We see him at work, meet his customers, who show their tattoos, and follow Horibun on a pilgrimage to a holy Shinto shrine. Martha Cooper’s pictures show the process of the tattooist’s work as well as finished motifs from an era long gone. Tokyo Tattoo was Martha Cooper’s first study of a subculture, which launched her on a ten-year-long immersion into the graffiti and street art of New York City.